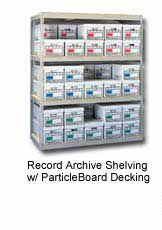 Buy record storage racks at low prices at Material handling solutions. 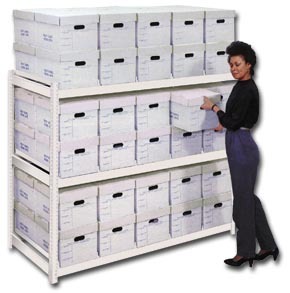 Our strong, sturdy 14 gauge units allowÂ files to be accessed from all four sides for fast and easy retrieval of records. 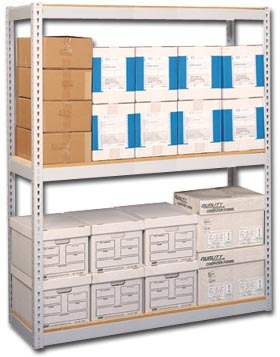 This type ofÂ record storageÂ systemÂ is a cost efficient storage system with rigid connections that provide solid support for decking. They are designed to hold record storage boxes and sturdy corrugated boxes are (available in cartons of 25 purchased separately). 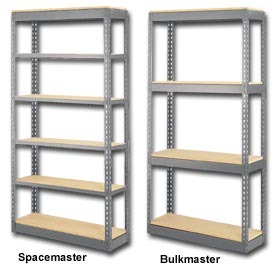 Particle board, steel decking, wire decking or steel box supports are optional and additional shelves are available. Our wire decking is an excellent alternative to wood and corrugated steel decking. It increases fire safety in your facility by allowing flow-through from sprinkler water systems. Check with your insurance company if having wire decks would reduce your premium. There is no dust or debris build-up on the shelves because of the open mesh pattern thereby providing a cleaner work environment. We offer many other types of material handling equipment. Please check out our large selection of various types of lockers andÂ storage cabinetsÂ to utilize your facilityâ€™s space to the fullest capacity. 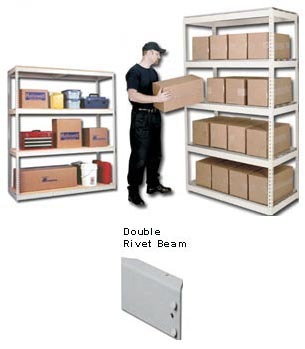 We have a huge inventory of pallet racks and we can usually ship any order within 96 hours. Call us toll free with any questions you may have and one of our specialists will help you find what you are looking for.